From the moment the news came out that on Sunday March 4th in Salisbury, one of England’s revered cathedral cities, a Russian spy and his daughter had been poisoned by some form of ‘nerve agent’, my reaction was ‘Oh dear’. Jeremy Corbyn correctly reminded Parliament of Tony Blair’s attempt to frighten people into going to war with Iraq with his ‘’dodgy dossier’ and 45 minutes claim. But most have forgotten that, four days before the huge demonstration in London the Army very visibly arrived at Heathrow airport, because there was a possible threat of planes being hit by al Qa’ida missiles. They disappeared after a day or so as it was obvious the protest by millions would go ahead anyway. The ever-increasing hysteria of the government and mainstream media in the days that followed the Salisbury incident was giving off the same nasty smell. All the ‘news’ was evidence-light and full of anomalies that no one addressed. It seems that once again, a government is trying to scare everyone, this time to make us point the accusing finger at Russia. Then I read a comment by a Salisbury resident: “It’s like a ghost town.” The government’s reaction had so frightened everyone that people weren’t coming to the city. Shops and businesses were suffering. I don’t exactly live a million miles from Salisbury, so I hopped on the train to see for myself how it was coping. 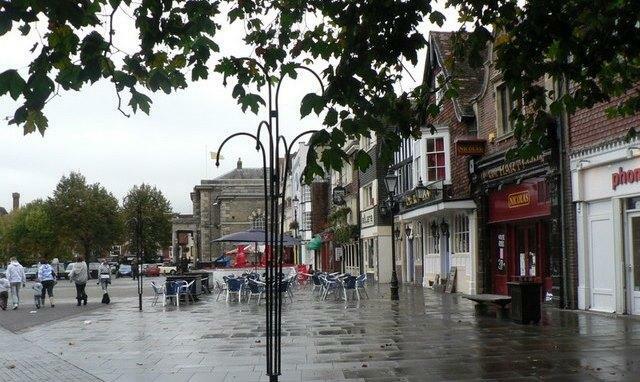 Visit Salisbury at any time of the year and it will be heaving with people coming to shop, to eat at one of the many cafes, restaurants and pubs, to visit the Cathedral and to walk through the ancient narrow streets. Not now, it isn’t. From the moment I walked out of the station towards the city centre I was struck by the lack of people. Plenty of traffic winding its way through the narrow medieval streets but pedestrians? No. I made my way to the Maltings where Skripal and his daughter had been found, collapsed on a bench. It’s a pedestrianised area, with a central green area (where that bench was) beside a river, surrounded by some big stores and lots of little, individual shops. Walk through it from the car parks and you come out into the old city centre with its ancient timber-frame and brick buildings. It’s not just popular with the locals, it is tourist heaven. On my way in there was a policemen on duty and blue-and-white cordon tape. Further in were more police guarding cordoned-off areas and some media – cameras and reporters making their filmed reports to Sky News or whoever. I overheard one of them saying “She is due to arrive…” Could I possibly have arrived just before our useless Prime Minister Theresa May finally came to Salisbury? I would have to wait and see. I filled in time with looking at some of the shops. There were five within the cordon, forced to close for nearly two weeks, and no end in sight. Beyond them, just outside the cordon, was an Original factory Shop Factory Shop with open doors. I didn’t go in. I didn’t want to face the embarrassment of being the only person in a large store not standing behind a counter. Sainsbury’s supermarket, on the edge of the Maltings, wasn’t faring much better. I tried the little shops, loved by visitors to Salisbury. It is nearly Easter. Windows were filled with Easter displays, and no public to enjoy them. In each was a lonely person waiting in vain for customers. I asked one of them how bad the trade was. “It’s twice as bad as it was last week,” she said, “and it’s getting worse.” Depressed, I went back and stood by the bridge over the river, waiting for May. The press were gathering, more cameras, microphones held ready. A Wiltshire policeman passed me and grinned. “We don’t usually have exciting things happen in Salisbury!” he said cheerfully. But Salisbury really could do without this thrill. May appeared with Chief Constable Pritchard and was immediately surrounded by the press. I heard an animated conversation going on behind me. It was Jon Snow of Channel 4 News, talking to some local people. They only realised who he was after he walked off, back to the city centre and away from the media scrum. Sensible man. Two schoolgirls passed May on their way back to school after lunch, one of them saying, “I don’t really care about her.” May went on a tiny walk-about and met one or two shop owners, probably handpicked for being Prime Minister-friendly. Then it was off to the Guildhall for a meeting with first-responders. 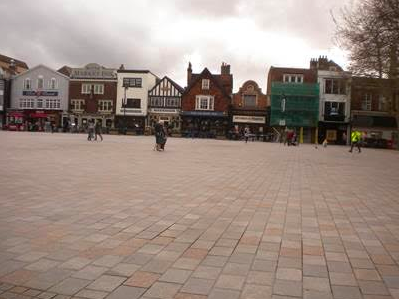 The empty Guildhall Square at lunchtime – every building in the photo is a café, pub or restaurant! Outside was a crowd, rubber necking, along with lots of police, some noisy police dogs, and a fire engine. Hovering overhead were helicopters and a drone. No wonder Salisbury residents and visitors are becoming fearful and staying away. Apart from the crowd standing outside the Guildhall, the large Guildhall Square was almost deserted, and this at lunchtime when offices empty and people fill the cafes, restaurants and pubs that surround the Square and it’s hard to find a free table anywhere. Now they were almost all free. Here and there I saw large signs outside the shops declaring, ‘Open for Business’. I had never seen the city like this and it broke my heart. It is scheduled to get worse. On Monday March 12th the Metropolitan Police Assistant Commissioner said that all the cordoned areas (of which there are several around the city) could remain in place for weeks, and that more could be set up. But Salisbury has had enough and is fighting back. 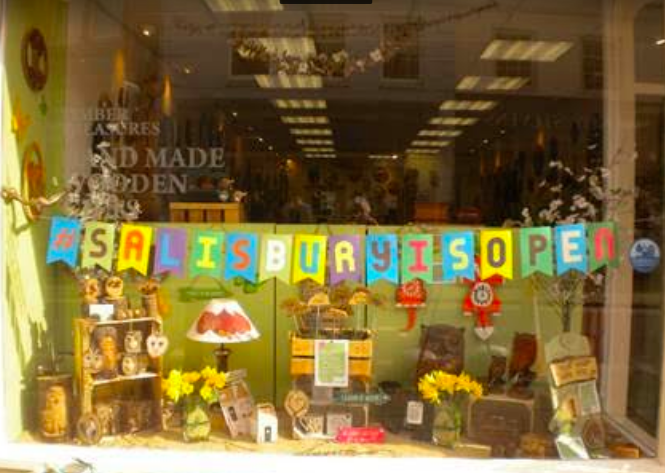 In a narrow street going towards the cathedral I found a shop window with a message strung across it: #SALISBURYISOPEN. Naturally I went in and asked the woman behind the counter what it meant. And it all came pouring out. “We’ve just recovered from all the ‘regeneration work’ on the car parks and the Maltings, when this happens,” she said, while explaining her message. The Salisbury Journal, the city’s weekly paper, is one to be envied by other places. The March 15th issue has a 12-page focus on the incident which puts the hyperventilating national press to shame. The Journal is also doing what government has failed to do. Ministers might insist Salisbury is ‘safe’, but that doesn’t match their scare-mongering. So the Journal launched the ‘Salisbury is Open’ campaign. That is what the ‘Open for Business’ signs are about. I was told how Salisbury residents are too frightened to come into the centre to shop. I was told of suspect vehicles being taken by the military to Porton Down, a fact confirmed by the Journal. The Journal carefully lists them: ambulances, police cars (some unmarked) and two vehicle recovery vans, over several days. 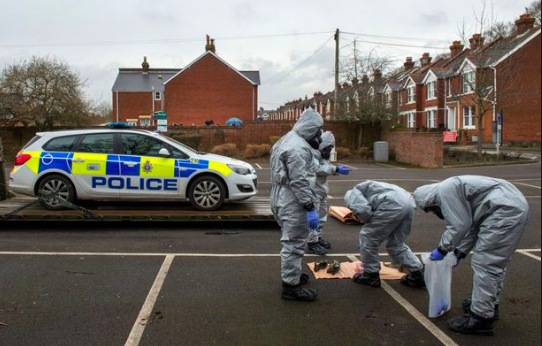 Altogether, about 10 or 11 vehicles, for the scientists at Porton Down to examine for the presence of a ‘nerve agent’. Scientists there must be tired of this, having apparently refused to identify it as Russian-made. But the real question, says the lady in the shop, is ‘What about Skripal’s car?’ a red BMW series 3. Why was it taking so long for the police to find it? Surely they would look in the Sainsbury’s car park first? They cordoned off the car park, but not until 8 days after the poisoning. Later they came back and cordoned off the ticket machine. It is known Skripal’s car entered the car park at about 1:40 pm on March 4th. When was it taken to the Ashley Wood Recovery Garage, and by whom? And indeed, why, unless to get it out of the way? Why did ‘incident response units’ examine a red BMW at the Garage on Thursday March 8th, remove an Ashley Wood recovery van from Winterslow village on Monday 12th, return to the Garage on Tuesday 13th, remove another recovery van from a Dorset town on Thursday March 14th and only then on Friday, 12 whole days after the incident, it is officially identified as Skripal’s car, and the Journal reports that it is being removed from Ashley Wood Recovery Garage, with the national media limping in a day later. 12 days. If this nerve agent is so very dangerous why is there so little to show for so much activity, and so many delays in dealing with it? Doesn’t it look like an exercise in propaganda? Are the counter terrorism police going trace all those who used the car park ticket machine? Are they going to cordon off any place (the cemetery is already out of bounds) where Skripal may possibly have been? Are they going to spin this out even more and gradually put all of Ashley Wood’s vehicles in Porton Down, and all its staff in hospital? Another local business ruined to further the UK’s anti-Russia campaign. The Chair of the Foreign Affairs Committee, said it was a ‘state-sponsored murder attempt’. But which ‘state’ are we talking about? It’s been clear for months that the government was using the Brexit shambles to hide the fact that they couldn’t govern the country and tackle its pressing issues – the health crisis, homelessness and lack of social housing, poverty and the awful results of its austerity programme. Now it seems that the government is using Skripal to hide the fact that they can’t govern Brexit either. And while they’re sorting out their fantastical mess, and if you live anywhere near Salisbury, go visit, eat out and buy something in the shops.